Garlic Pesto or Spread is fantastic to have on hand to spice up sandwiches and stir into pasta, soups, etc. I love to stir a spoonful of this wonderful spread into whatever I am cooking without having to stop and chop 1 or 2 cloves of garlic every time I cook. Once you try it, I am sure you will find your own special uses for this delicious spread. For perfect garlic bread, slather a generous amout of the Garlic Pesto on a split baguette or Italian or other bread and toast in a hot oven and golden and watch it disappear in seconds! Spread some on grilled sandwitches or mix a spoonful into veggies before roasting them - so useful and delicious. Garlic Pesto could be added to salad dressings also. The word pesto is often synonymous with the popular Basil Pesto; but it is anything that is pounded or pulverized! Here are a few others to try: Pistachio Pesto, Cilantro Pesto, irresistible Chile Pesto, and the amazing but deceptively simple Kerala Style Shallot-Chile Pesto. Peel, wash, and chop the garlic finely. Sprinkle a pinch or two of the salt on top and mash with the flat side of the knife blade until mashed. This can be done in a food processor as well. Place the garlic in a clean dry jar and add the herbs, spices, salt, and a little of the olive oil - about 2 Tbsp - and mix well. Add more oil so that the garlic spread is completely covered by a layer of oil. Cover and keep in the refrigerator. This spread will stay fresh for a couple of weeks. Neyyappams (pronounced "Nay-up-pums") are classic South Indian sweet spherical fritters which often include ripe bananas and constitute an integral part of many celebrations. The well-loved appams are made for birth ceremonies, memorial ceremonies, various holidays, or simply as a special snack. 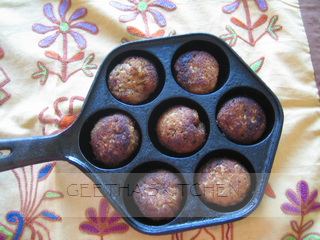 Appams are made in a special pan called 'appa karai' or 'paniyaram' pan in Tamil and is similar to the Scandinavian aebleskiver pan, Japanese takoyaki pan, or the Thai Kanom Krok pan which gives them their characteristic spherical shape but can also be made without any special equipment. It is worth the investment in this pan since it can be used to make wonderful treats using other muffin and pancake batters for special occasions; I use it to make savory 'Vellai appams' using leftover dosa, idli, and adai batters. The nice thing about this pan is that it won't heat up the whole house like a fired up oven especially during summertime. Appams are traditionally made with rice; I have added the whole wheat flour and the oat meal because they make the appams a little softer and fluffier. They can be made gluten-free if the whole wheat flour and oatmeal are omitted and dairy-free as well if made with oil instead of the traditional ghee. Sesame oil (but not the Chinese toasted kind) is a good choice as is canola oil. Occasionally I like to add finely chopped apples, canned Jack fruit, etc. in place of the bananas for a variation. For an equally delicious baked version, see Baked Neyyappam. Peel the bananas and place in a large mixing bowl; mash well. Peel the cardamom pods and discard the shells. Grind the seeds finely with a pinch of sugar using a mortar and pestle; add the ground cardamom to the bananas. Add jaggery/brown sugar and mix well. Mix together the rice flour, salt, whole wheat flour, coconut, and oats. If you are not using the whole wheat flour or oats, add 2 tsp corn starch. Stir in the dry mixture into the bananas with just enough water - add a tablespoon at a time - to make a thick batter. Allow the batter to rest covered for an hour or even overnight so the flours can hydrate well. Mix the baking soda and powder into the batter just before cooking. Coat the 'appa karai' lightly with a little oil or a cooking oil spray and heat over moderate heat. Test the pan by dropping a tiny bit of batter; if it sizzles, pan is ready. Pour about 1/3 teaspoon of ghee into each indentation, and fill each 3/4ths full with the batter - if no wheat or oats are used, the batter will not rise very much during cooking. Keep the heat low to medium so the batter cooks slowly; adjust the heat as necessary. When the edges change color and the bottom has browned, loosen edges carefully with a skewer or a small spoon and turn them over to cook the other side. When the appams turn a rich brown or are plum colored with no uncooked batter inside (check by inserting a skewer through an appam), remove them and set aside. Repeat the steps above to cook the rest of the batter. Serve hot, warm, or at room temperature. Although they need no further adornments, sometimes they are dusted with powdered sugar or rolled in granulated sugar before serving. Appams will last about 3 days at room temperature; freeze in freezable containers or zipper bags for longer storage and thaw out and warm as necessary. NOTE: If you do not have the special pan, the batter can be cooked in a skillet. Pour small spoonfuls and cook over low/moderate heat with a few drops of ghee/oil; flip over and cook both sides until nicely browned. Although these will be shaped like pancakes rather than spheres, they will taste lovely still. Alternately, they can be deep-fried by dropping small tablespoonfuls of the batter in the hot ghee/oil. An egg poacher will work also if you have one. Lemongrass as well as green tea and mint are known for their many health benefits. So why not combine all three for a wonderful and healthful beverage? It turns out great and is absolutely delicious! A refreshing beverage that can be served hot or cold, I often make a large quantity so that there is plenty left to chill for a cooling beverage later. You may sweeten the tea if you wish, but I find that it is just perfect as is whether served hot or cold. 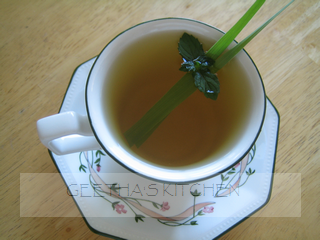 You can use whole stalks or use a few of the outer leaves to make tea. 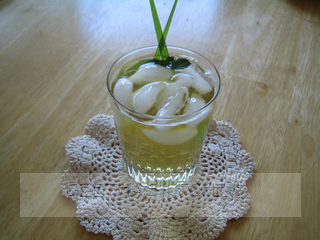 If you like the health benefits of lemongrass but not its flavor so much, add strong herbs like mint; mint works wonderfully well with the lemongrass. Would you like your tea hot or cold? Bring 2 quarts (8 cups) of water to a boil. Meanwhile, wash lemongrass leaves and chop using a sharp knife or snip with kitchen scissors into small pieces. Chop the mint coarsely. Place the tea in a tea ball or tie loosely in a square of muslin if you wish. When the water starts to boil, add add the herbs, cover and let sit for 5 minutes. Add tea, stir, and cover and set aside to brew for another five minutes. Strain and serve hot or cool, chill, and serve over ice cubes with lemon/lime slices if you wish. Serve the tea with or without sweeteners - as you wish. Enjoy in Good health! Cheers! 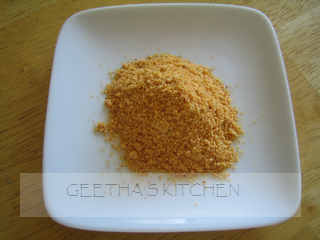 Mulagai Podi is a dry chutney that is mixed with oil/ghee and is used as a dip for dosa, idli, adai, upma, etc. Mulagai Podi means literally chili powder; but this is obviously more than just ground chilies. 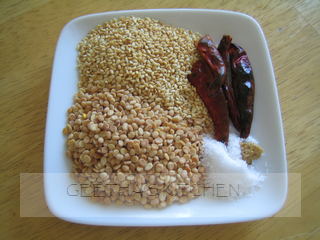 Traditionally dosa, idli, etc are served in homes simply with this podi and oil/ghee. Amma often packed a lunch of dosa or idlis rolled in mulagai podi mixed with a little oil - they tasted so wonderful that my friends often wanted a share of my lunch :). I am amazed yet again to find so much similarity between Indian and Japanese cuisines. Their furikakes are similar to the Indian chutneys and curries; in fact Mulagai Podi is a close cousin of the Japanese sesame salt, gomasio. Mulagai Podi is delicious sprinkled on buttered toast, vegetables, or steamed hot rice; some people I know (who shall remain anonymous ;}) even sprinkle it liberally on their pizza! Often called Dosai Mulagai Podi to differentiate it from plain ground chilies, it is easy to make and makes a nice table condiment to spice up any food you like. There are many variations of it and some include other ingredients such as roasted chana dal, curry leaves, cilantro, tamarind, etc. This is one of my favorite versions and since it includes a goodly amount of sesame seeds (ellu), it is sometimes called Ellu podi. Every sprinkle of this delicious podi boosts the protein content of your food since it contains both sesame seeds and urad dal (a type of legume). Roast the sesame seeds in a dry skillet until fragrant; they will start to pop a little like popcorn. Remove from heat and let cool on a plate. If left in the skillet, the residual heat will overcook or burn them. Roast the dal, chilies, and the asafetida in the dry skillet until the dal is golden brown. Let cool. Grind all the roasted ingredients using a coffee grinder with the salt in batches - the texture of the finished podi should be like brown sugar - slightly gritty but without any whole dal. Mix well and keep in an airtight jar in a cool cupboard.